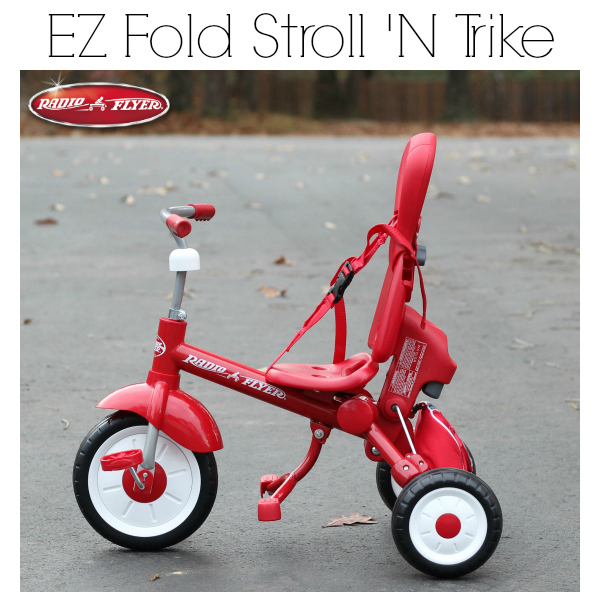 We received the Radio Flyer EZ Fold Stroll ‘N Trike for inclusion in the 2013 It’s Gravy, Baby! 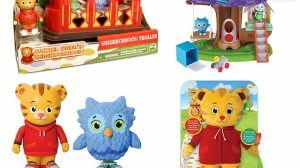 Holiday Gift Guide. All thoughts and opinions remain my own, as always. For Bryson’s first Christmas, we bought him the Radio Flyer Ultimate Family Wagon as well as the Turbo Turtle. Four years later, both of those Radio Flyer items are still going strong after hours upon hours of play between Bryson and Bella. When I think of the Radio Flyer brand, I think of red wagons and excellent quality products that last. When Bella began asking for a trike (or a “bike” in her words), I knew I could count on Radio Flyer to have exactly what I was looking for… and they did! 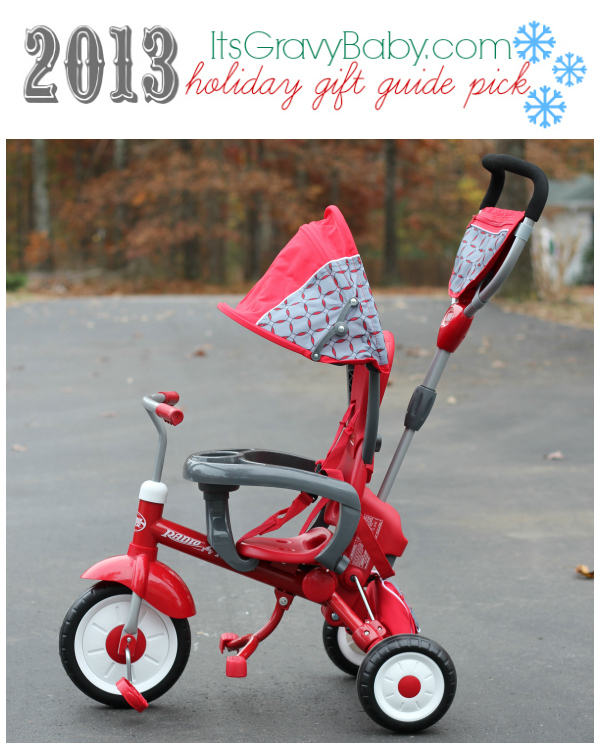 We settled on the Radio Flyer EZ Fold Stroll ‘N Trike for Bella’s Christmas gift this year. It had everything I was looking for and then some. Since I know it will hold up, it will be passed down Brynlee when Bella is ready for a two wheel bicycle. It’s a 4-in-1 tricycle and recommended for kids ages 9 months to 5 years. Storage– With two storage compartments, both the parent and child have space to store their necessities. The top storage compartment on the parent handle is perfect for storing your wallet, keys, smartphone, etc. The bottom storage bag will hold small toys like stuffed animals. 3 point harness and high back seat ensure that both infants and toddlers are safe. I especially like that the 3 point harness can stay attached even with older children. Safety tray doubles as a snack tray and cup holder. The tray is deep enough that you can pour snacks right into it and cups will stay put. It also functions to give infants a tray to hold onto and keep them in place. 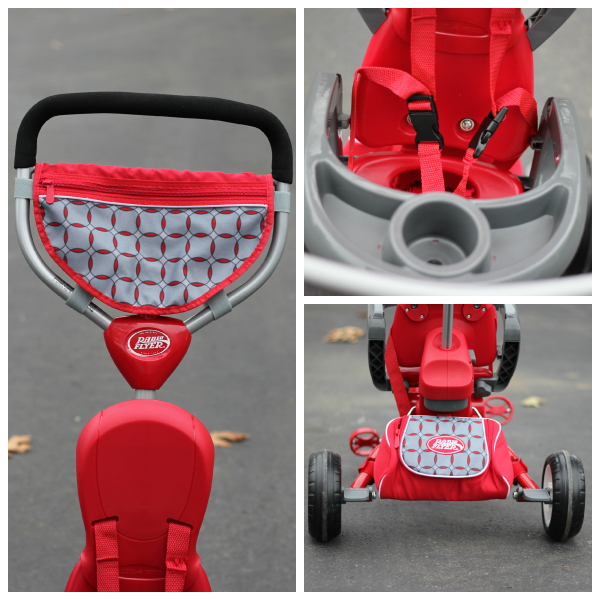 Adult Steer & Stroll™ Adjustable Push Handle– This feature is a must-have and a back-saver for parents. The handle is easily removable for older kids who have good control and no longer need help. For infants and toddlers, parents can push them and steer without constantly bending over. Canopy– The canopy is removable and offers UV protection. It can be rotated to shield the sun no matter the angle and easily folds up so you can push it out of the way without removing it. 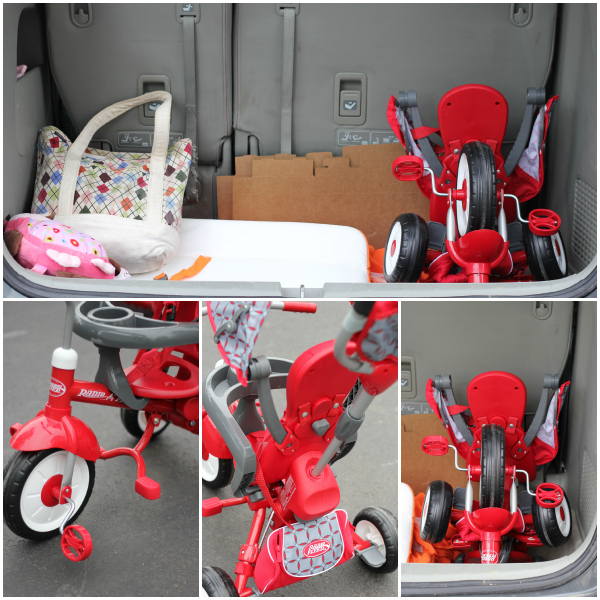 EZ Fold– As the name suggest, the Radio Flyer Trike folds easily for storage or transportation. You can see in the photo above that it takes up very little space in the back of our van which makes it perfect to take on strolls around the lake. 4 ways to ride – It grows with your child from 9 months on up to 5 years. The features are all easy removable- no screwdrivers necessary- as the attachments either snap or screw on with plastic pieces. The high-back seat and harness can also be removed (not shown in my photos) as well as the safety tray, push handle, and canopy. I have no doubt that Bella is going to love her new Radio Flyer trike Christmas morning! With so many fantastic features, it’s perfect for both the parent and child. I have a feeling she’s going to load the storage compartment with a baby doll and a blanket and make her way up and down the drive. Justin assembled the Radio Flyer EZ Fold Stroll ‘N Trike when I wasn’t around, but said it was easy. I was able to disassemble and remove the attachments with no problem. Putting them all back on was also a breeze. You can purchase the Radio Flyer EZ Fold Stroll ‘N Trike at RadioFlyer.com. 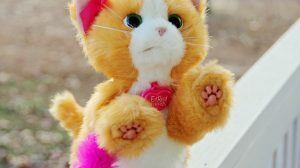 It’s available in red or pink. It retails for $139.99 and will last for years to come! OOOH I HAD THE RADIO FLYER WAGON! How convenient to have a stroller that can be compacted in some regard. Who would have thunk it? Love how much life it has because it can be adapted through the ages! Very fancy! Not only stylish but practical! I love how easy this is to fold, and what a fabulous trike it is. This is super cute! Perfect for a Christmas gift under the tree from Santa! This is really a perfect Christmas gift for Santa that can bring a great smile for your love ones.Very practical and easy to fold.This fantastic stroll gift is the perfect way to get the little ones (and old ones) excited a Christmas Eve.Thanks for sharing this. we have this too and love it!!! I so wish that was around when my kids were little. I absolutely love it. Brilliant modern day retro! I so love the traditional red wagon! But this is so awesome… especially the folding aspect of it. Perfect for trips to the park or bike trails (ours is paved). We have a regular Radio Flyer trike that both my boys used. They LOVED it, but it was hard for them to use when they couldn’t pedal yet. I think this is such an awesome idea because you can push them! I’m amazed at how small it folds down too. I’ll definitely be investing in something like this next year for Nova. Love your pictures! We have this same trike and love it. Great review! Great photos! I LOVE Radio Flyer (I mean, they’ve been around since I was a kid!) and we have one of their wagons. 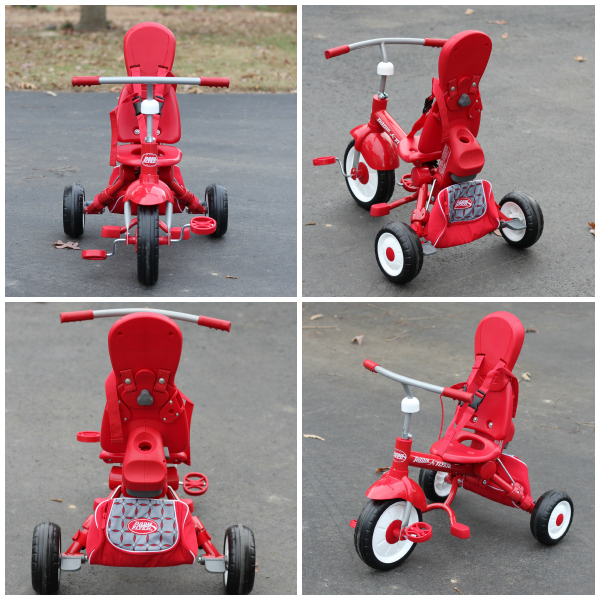 This trike is awesome–it will last so long as your child grows with it, love products like that! Holy cow, they just keep getting better and better, don’t they? We got Radio Flyer’s latest trike a couple years ago and we love it. Our 3 year old has been using it, but I’m going to put all the attachments back on soon so that our 10 month old can ride on it. This is so cute! I love how it folds up so nicely! Love how compact it is. radio flyer never disappoints when it comes to quality and great function! need one SOO bad- our wagon that we use is broken and we love walking the neighborhood. Would be great for vacation with how portable it is!